About a month ago, I got a little device that scans printed text into my computer line-by-line. Well, that’s not entirely accurate. The truth is that I got it about a year and a half ago, but when it arrived, I discovered that—despite having seen online that it worked with Macs—it didn’t have a Mac-compatible driver. When I called tech support, they kindly explained to me that there were two different C-Pen 20 products, one branded by Ectaco and another that was not. The non-Ectaco pen was Mac compatible, while this one was not. They did, however, assure me that they were working on a Mac driver so if I held onto it, sometime in late 2009 or in 2010 it would be usable on my Macbook Pro. So I stuck it in a drawer and periodically checked for the driver. Finally, last month, when I checked (as I was starting to pack the scanner to resell), the beta for a driver that would work with my system had been posted! But while the discovery of the scrolls has provided answers for most of the questions raised by Josephus’s description of the Essenes, one major issue remains unanswered: is the division of Second Temple Jewish society into three schools a schematic construct invented by Josephus, or a more or less accurate reflection of the historical reality of the day? The publication of the Dead Sea Scroll known as Pesher Nahum indicates that it was not just Josephus who divided Jewish society into three schools — the Pharisees, the Sadducees, and the Essenes — but the Essenes themselves adhered to this view. The great and still undischarged task which confronts those engaged in the historical study of primitive Christianity is to explain how the teaching of Jesus developed into the early Greek theology, in the form in which it appears in the works of Ignatius, Justin, Tertullian and Irenaeus. How could the doctrinal system of Paul arise on the basis of the life and work of Jesus and the beliefs of the primitive community; and how did the early Greek theology arise out of Paulinism ? Remarkable. This little device is changing how I record my research; I have actually devised a system of commenting on the book (or copying an earlier marginal quote) in a different typeface within the document in which I import the scanned text, allowing me instant access to critiques of specific passages or points that might otherwise stay trapped in a book on my shelf. 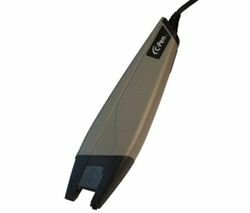 I’d highly recommend this little device for anyone wanting quick access to quotes or wanting to take his/her library research with him/her on his/her computer. The next step is to get something like this to plug into an iPhone or iPad—that would be a killer product. Looks like a great product, and one that I will have to add to my arsenal in the near future! Do you know if there are any pen-scanners out there without USB tethering that work equally well? How does the C-Pen fare with greek? My thoughts exactly. I only want a handheld scanner to keep track of all my books/CD/DVD’s/. I need something that I can take all ’round the house, scan a shelf or two of books, then connect it to my PC and enter all the information into a Works database, but all the handheld scanners that are portable and have memory all seem to be either out of my modest price range, or too many of the reviewers report problems. Jay, the best thing for you may be to use a smartphone. There are lots of apps out there for Android or iOS that allow that to be done using a smartphone’s camera. Have you used the captured data to be saved into a database yet? I am trying to find one that works well with SQLite so I can populate data from reference books into the database to be worked over by Python scipy, numpy, etc. Thanks. I haven’t tried that, but it would probably work.